Is LottoYear a Scam or Legit? Read Reviews! Yet another online lottery provider – LottoYear.com. There are so many of these sites popping up, I guess there is good money in running them. I love the fact that I can play lotteries internationally from anywhere. But – yes the big but – figuring out which one to choose is important. 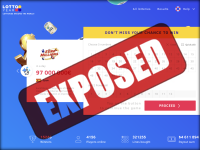 Let’s go take a deeper look at what LottoYear.com actually provides – or doesn’t. LottoYear.com offers players four lotteries online, EuroMillions, UK Lotto, US Powerball and US Mega Millions. They say that SuperEnalotto and La Primitiva is coming soon. At least they are upfront that they are still getting this site up and running for offering access to international lotteries. There is a minimum of 4 lines to play here so don’t be looking to click on 1 line to play. Ticket lines can be your favorite numbers or quick picks. They also offer the ole multiplier (US Powerball) where applicable. There are discounts for playing multiple draws at 5% discount for three. There doesn’t appear to be any other discounts or multiple play options. Don’t look here for syndicates at this point. Then again, this is a fairly young site so maybe it’s up on their plans. Now that’s a good question. There is nothing on LottoYear.com’s site referencing how you get your winnings, commission or fees. There is no information. I really got a little ditz’ed re their info on taxation. LottoYear.com plays US Powerball through three states, all of which require both federal and state tax. Take New York State which means at total of 44.17% federal, state and city tax (their posted figures). Add the fact that they play EuroMillions through Spain, which means a 20% tax on anything over €2,500. Who Can Play at LottoYear.com? You’d think that with offering online chat in 15 languages, LottoYear.com would be responsive – not. I had a bunch of questions for these guys (sorry gender not friendly) and no answers. They offer an “online chat” but I’m not sure when anyone is there. LottoYear.com is supposedly based in Hong Kong, but there didn’t seem to be any snail mail, telephone or email contacts. The only contact on their site was an address in the Commonwealth of Dominica. Would you mind rating LottoYear.com? Seriously! The simple fact of the lack of contact details is enough for me to give these guys a pass. Add to that, I don’t like sites that have such limited access to online lotteries. I get that they are new but why bother if you’re only going to offer access to four lotteries. Add to that there are no terms and conditions, and how the heck do I get my winnings. Give me a break folks. This site gets a thumb’s down. At the very least, I want to make sure I am going to get my winnings and how I’m going to get them. And why the heck would they go with states that up the ante on the taxes taken.